Tips and Tricks: What’s in Your Toolbox? 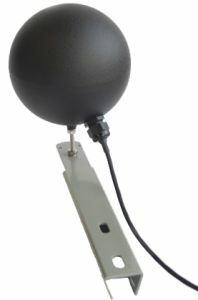 Campbell Scientific now offers the BlackGlobe, a sensor u sed to assess heat stress experienced by people. Heat stress is a serious situation that can result in fatigue, exhaustion, diminished physical and mental efficiency, and possibly even disability or death. Those who are at risk for heat stress include athletes, soldiers, firefighters, farmers, construction workers, and others who work outdoors in hot environments. The BlackGlobe measures radiant temperature with a thermistor inside a 15.2 cm (6 in) hollow copper sphere that is painted black. 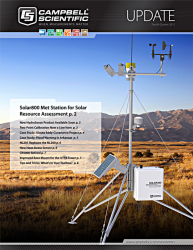 This measurement, along with the measurement of ambient air and wet-bulb temperatures, is used to calculate the wet-bulb globe temperature (WBGT) index, which is an accepted standard for evaluating environmental heat stress. When the WBGT index indicates an increased risk of heat stress, appropriate actions can be taken to prevent detrimental health issues.